It’s not pleasant to think about the minister you know and love checking himself into the psych ward after church. After all, earlier that day he was on fire: his sermon was passionate, he baptized a whole family that joined the church and then after two worship services he taught confirmation to the largest class of youth the church has seen in decades. What happened to the pastor? This particular scenario, while fictitious, closely resembles true stories that I’ve heard again and again since I began working with churches on the topic of mental wellness. The most tragic part is that mental illness experienced by ministers is frequently endured in secret for fear of the church finding out. Ministers fear losing their jobs, or worse, being removed from ministry by losing their authorization to serve the church. There is not yet a safety net for clergy mental health; a way for clergy to seek mental health recovery and treatment without stigma, shame and judgement by the church. There are exceptions, thankfully; clergy whose churches graciously allow medical leaves to recover from depressive episodes and then welcome the minister back into the pulpit. But even in this case, the church was already a safe community for the minister to reveal their mental health challenges before there was a crisis. The minister was not “in the closet” about living with a mood/brain/mental illness/disease/disorder. Why are so many clergy in the closet when it comes to their mental health status? Studies have shown that in general clergy tend to experience depression at a higher rate compared to the general public. The National Alliance on Mental Illness reports that one in five persons will experience an episode of mental illness in a given year. Clergy are human, too, and not divinely protected from experiencing mental illness. We also know from research based on the national Transition into Ministry programs that young clergy who leave ministry often report that it was because of loneliness, social isolation and depression. There is also increased risk to clergy for addictive behaviors as a coping mechanism. Additionally, clergy often serve in communities with fewer mental health resources, making quality care challenging. It’s not unusual for the minister to be the only “counselor” in a small town. How can Christian communities create healing, safe spaces for clergy to come out of the closet about their mental illness? The first step is to eradicate the stigma and shame. There is nothing shameful about a minister who has a diagnosis. We don’t attach stigma to clergy who have heart disease or diabetes. If a pastor is in the hospital following a heart attack, the church prayer chain is activated and hot dishes and brownies are baked. But when a pastor is in the psychiatric hospital after church on Sunday because of a psychotic break, what happens? Why? Because the minister and his family are too afraid to tell anyone in the church. They are silent in the midst of their suffering. No prayer support. No hot dishes or chicken casseroles. Instead, after five days in the hospital and after being discharged with a new diagnosis and new medications, the pastor is back in the pulpit the following Sunday and nobody knows any better. Closeted in the church by stigma and shame, clergy and their families too often suffer alone and in silence. And the church suffers, too. I’ve sat in circles with youth who share that their pastor parent has bipolar disorder, but it’s kept a secret from the church. The young person said being in the closet about the mental illness made the parent seem like a hypocrite. Not knowing about their minister’s mental illness, the church is unaware of the complex life their pastor and their family live. This silence that leads to a lack of knowing creates unhealthy dynamics that negatively impacts everyone involved. The crisis of clergy in the closet when it comes to mental illness will not improve until seminaries and authorizing bodies address comprehensive clergy mental health, and churches become educated about mental health, equipped to support people with mental illness and their families, and encourage clergy to make mental health just as important to their spiritual life as prayer. May God bless clergy who dedicate their lives to caring for others, sharing the love of Christ with a hurting world. May God give churches and clergy the courage to kick mental illness out of the closet. The only thing that should be in a minister’s church closet is a robe. It is indeed a sad fact. Alcoholism is in the same category; a disease no one wants to talk about. Yes, I have a friend who works in the recovery community and we often talk about the stigma and shame that people with addictions experience. Thank you for your comment. Great article. I agree wholeheartedly. thank you, I’m a pastor’s kid (worst curse ever). I know many churches who would never have let me dad preach because of my illness. I can’t even imagine what it must be like when the pastor is the one whose sick. I have heard from other pk’s that there is a lot of pressure to be a certain way. Thanks for sharing your story. Well written. This is also true for most all professions. As a society the stigma we have created regarding mental illness is regretful and shameful. Through education, open dialogue, grace and a mass amount of love will we begin to change. The stigma and shame in society is a large part of the problem. The church seeks to be counter-cultural in many ways. I hope that church can work to be a place where stigma and shame around mental illness is eradicated. Thank you for this. After my spouse of 25 years walked out during Advent, I experienced a spiraling depression. I remember nothing of most of the next year. Until I had my suicide planned. I was fortunate. I had friends who came to my rescue and got me into a day program. I had to lie to my church and say I was taking classes. I could not tell my superiors. I am healthy now but much of what you said resonated. The first thing my superiors did after my spouse left? They met with me to go over the conference dating rules. Unbelievable. Thank you for sharing part of your story. It’s important that we shed light on this issue. It is disheartening to hear about how you were treated. My hope is that we can work to change the sigma in the church. Great article. Some clergy who have come out of the closet about their mental health issues have lost their jobs as the church’s pastor in incredible speed and lack of grace. I have heard of one pastor who was open about his bipolar disorder with his young congregation. They were very supportive and the church grew. He wrote the book, Churches that Heal which is a very good book, but does not propose any healing steps for a mental illness. It’s more about having a healthy church climate that helps heal broken lives. 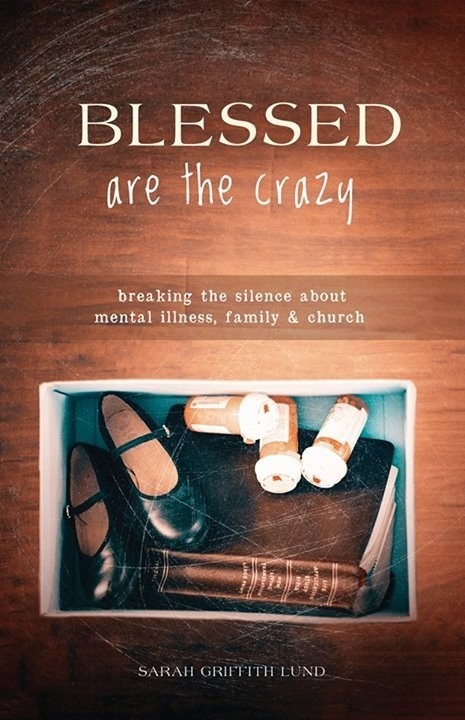 The only criticism that I have is that I wish the word crazy was not in the title “Blessed is the Crazy” “Those with a mental illness” would have been better because people are not their diseases. There’s much work to be done in this area for both clergy in the closet and church members in the closet because of so much stigma in the church about those who have a mental illness and some stigma about even their families as well. Otherwise, thanks for writing this article for those of us who have been in the closet. It is a very lonely place to be and even lonelier when it is a spouse or other family member with the mental illness.